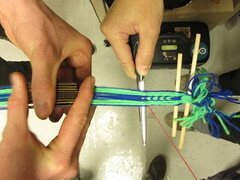 This post is from card weaving workshop by Kati and Ramyah (eCraft Collective) at the Physical Computing Meeting at Fablab Berlin. 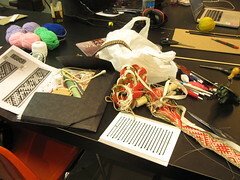 During the Physical Computing Workshop, KATI HYYPPÄ and RAMYAH GOWRISHANKAR from eCrafts Collective has gave a card weaving workshop. 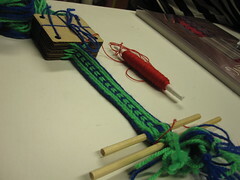 Card weaving is an old technique to weave, practically everywhere without fixed loom. They have learnt this technique in Latvia from a mysterious old lady, and further inherited this knowledge to us. Well, at this point, it is physical, but not computing.. 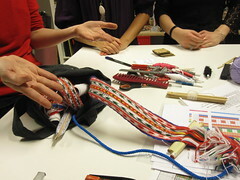 Although the concept of weaving is very much connected to computers as the weaving machine was one of the first application of the computers.. Our idea is to learn this technique and later to experiment with conductive materials or other computing components. It is nice to be able to make the materials from scratch. 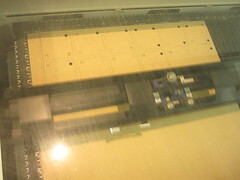 After cutting the card is the threading. 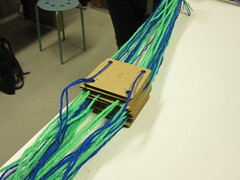 We chose to make 10 card design with 2 colors, which means we need 40 threads. 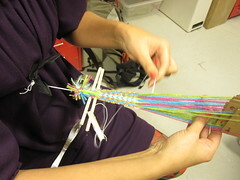 Cut 40 thread (20 of each color for this design) in same length (should be longer than the amount you want to weave). 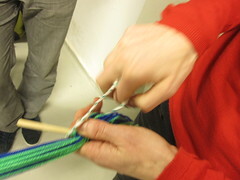 After you prepare the thread, tie one end, hook it on cramp (or any fixed object) and carefully thread to the card hole one by one following the pattern design from card 1 to 10. 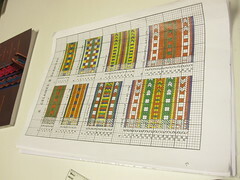 The design indicates which of the color should go to which hole and from which direction (either from bottom or from top). After you thread all the cards, tie the card together making sure the order and facing directions are the same. This is to make sure your cards does not start flapping around when you sort out the rest of the thread. 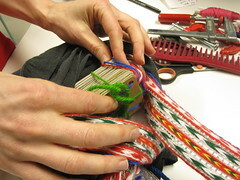 After you fasten the cards, open the knot on the end and comb it so the threads are separated and straightened. 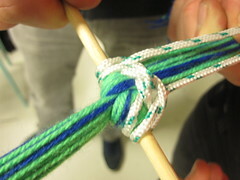 Then knot it again. 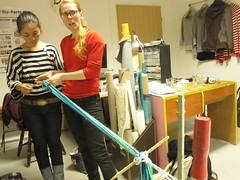 Prepare a 30cm thick string and make a loop. 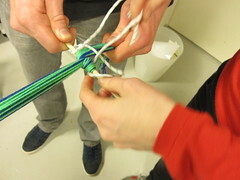 Place a wood stick between the knot and wrap it around with the thick string loop, knot it few times to fasten it. Now, tie the other end. 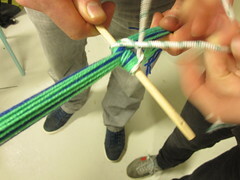 Prepare thin string (30cm) and make a loop. 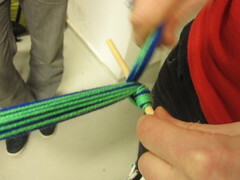 Hoop it around the tied end and knot it for few times so it fastens. 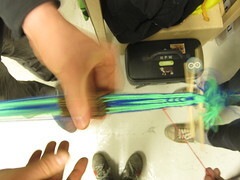 Wrap around a string around your chest and connect it to this thin string loop. 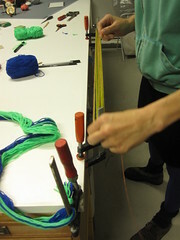 Hook the other end thick string loop to door knob (or some kind of fixed position) and suspend the threads. 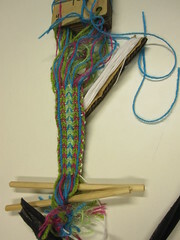 Place a wooden stick between the thread close to the end near you. Now turn the card for 180 degrees (this is called half turn). 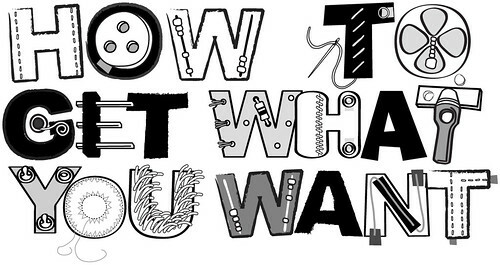 The direction does not matter, it just have to be always the same. I did it always away from myself. 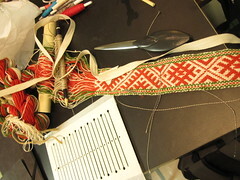 Ok, now you are ready to weave. 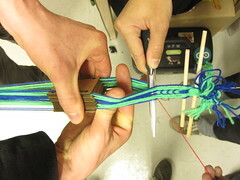 Turn the card all together 90 degrees(called quarter turn), wiggle the card to separate the top and bottom thread clearly, place a knife (or some hard material) between the tread and push it toward you. 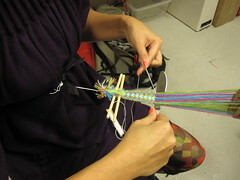 Place a weft thread (it is handy to wind it around small piece of paper) and push it toward you again. 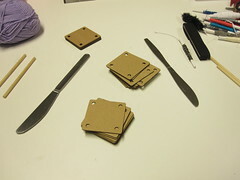 Turn the card quarter turn again, wiggle the card, place the knife and push it toward you, place the weft thread … so on. 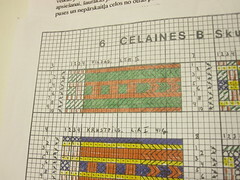 Continue this and you start to see the pattern on your fabric! 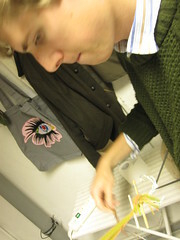 This is how you do the card weaving. Now all you need is concentration and patiance. 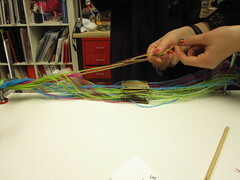 Kati and Ramyah has been embedding fiber optic and conductive thread when weaving. 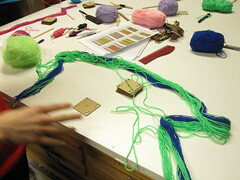 It is a bit tricky to mix these materials as they behave differently from wool or acrylic yarn when weaving. Need a good skill and practice.